Zoolander 2 costume designer Leesa Evans thought of fashion as another character in the film. Fans of the 2001 model movie have been getting excited as the second instalment is now officially in the pipeline. 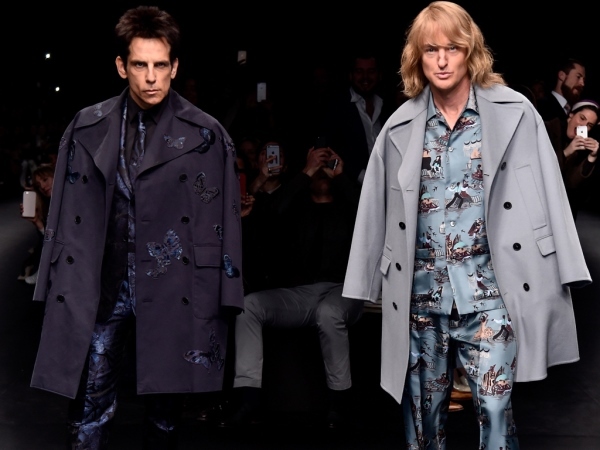 Main stars Ben Stiller and Owen Wilson drummed up even more interest when they stormed the Valentino runway as their film alter egos Derek Zoolander and Hansel during Paris Fashion Week earlier this month. "The movie is a comedy and fashion is a character in the film. That’s what was so brilliant about the first movie, they played with the fashion," Leesa smiled to The Hollywood Reporter. "It’s different this time, because we are celebrating couture and runway looks maybe a little bit more, because there is so much about fashion that is so beautiful and so much that is so provocative. It’s also healthy to have a bit of a laugh at ourselves." Valentino isn't the only fashion house to jump on board with the new film; countless other big name designers also want a piece of the action. Zoolander 2 hits cinema screens next year and will be a visual feast for fashion lovers. "We’ve had a lot of great collaborations, so yes, we probably have more fashion in this film, because people have been really interested to get involved. We have great designers on every level, whether it’s Saint Laurent, Kenzo or Opening Ceremony, they’re all excited to be involved," Leesa revealed. While the franchise is a comedy, Leesa is open to people taking more from the film than just laughter. "The main thing I really want to do is support the film and make it as memorable as possible and if for some reason people get inspired by the wild fabrics and styles I’ve created, I’d be honoured," she smiled. "The thing is that the sky’s the limit. The worst thing we could do is not have fun with it."